6,188,818 lbs. of annual CO2 ﻿e﻿missions have already been reduced. ​ That's like taking 848 Marin homes off the grid permanently! ​Watch the one minute video below that won a national award in 2014. By the time the "Carbon Posse" team of Mill Valley- graduated, they'd taken actions equivalent to removing nine cars from the road. The eight households reduced their carbon emissions by more than 96K pounds! This is all thanks to their efforts to take small steps with big rewards like eating less meat and insulating their homes. Also, all that could, opted-up to MCE Deep Green electricity and two families are getting electric vehicles to replace their fossil-fuel powered cars. To increase their resilience by being prepared for a disaster, every family got their emergency supplies together and most of them developed a household plan. Three will take the CERT training to become leaders in their community in the event of an emergency. For Adrian Elrod, his time with the team also gave him ideas for growing his window-washing business, True Vision Window Cleaning. "As I got to know the other team members, I realized that I could refocus my business and specialize in washing solar panels," he says. "At the same time I got great ideas on how to make my business more sustainable." Adrian switched from conventional to all-natural cleaners, and from a truck to a hybrid that is 4x more efficient than his previous vehicle. Going forward, he has put in an application to become a green business and is looking forward to the release of a new EV truck. "I feel like this is the future," he said. "Specializing in solar panels enables me to build a more sustainable business that helps people get the best return on their solar investment." Congratulations Carbon Posse! You give us so much to celebrate this Earth Month! Click here for details on new Teams starting now. It's free, it's fun, and it's easy. Did you know our affluent Bay Area lifestyles would require FIVE EARTHS to sustain if everybody lived like we do? 65% of local carbon pollution comes from our household decisions. It's our driving, our home energy and water use, and the waste stream from our purchasing choices. Resilient Neighborhoods Climate Action Teams undertake carbon-reducing actions that make a difference. It's not all about carbon, either. In this free 5-session workshop you will reduce your carbon footprint and get prepared for emergencies. Taking simple actions like trimming energy and waste, conserving water, and making smarter transportation choices can save money too. You’ll see the positive results of your actions and help build a stronger and safer community. Nearly 1,000 people have reduced 5 million pounds of CO2 pollution through Resilient Neighborhoods. All you need to participate is a computer, access to your utility bills, and a desire to join with other community members to create a better future. New Climate Action Teams are forming now. Check out the schedule here. 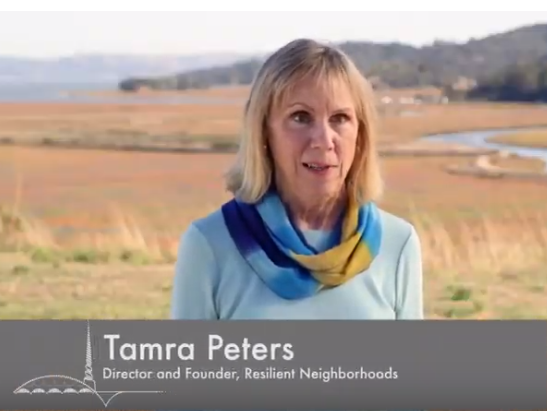 Click here to watch the State of Marin County 2019 video featuring Resilient Neighborhoods. RN receives MCE's 2018 Charles F. McGlashan Advocacy Award in recognition of RN’s passion, dedication and commitment to advocating for 100% renewable electricity. Pictured below. Pictured above, Tamra Peters and Supervisor Kate Sears. 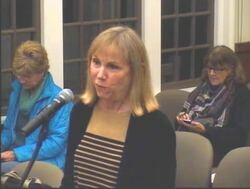 Click on the image below to see Tamra Peters' 2016 presentation to the San Anselmo Town Council. Resilient Neighborhoods mentioned in a letter to the Marin IJ Readers' Forum. Check it out here. In the Marin IJ, Wendi Kallins wrote about the ways in which Marin is addressing climate change, including the Resilient Neighborhoods program. To read the article, click here. ​In Bicycle Retailer, RN team participant and volunteer, Marilyn Price, wrote about how the Resilient Neighborhoods program inspired her to go carless and rely 100% on her bike for transportation. To read her letter, click here. We were one of 13 partner organizations that organized the Time to Lead on Climate - CA : US : UN forum on Nov 9th, 2015, which attracted over 800 attendees. You can watch a video of the event here. 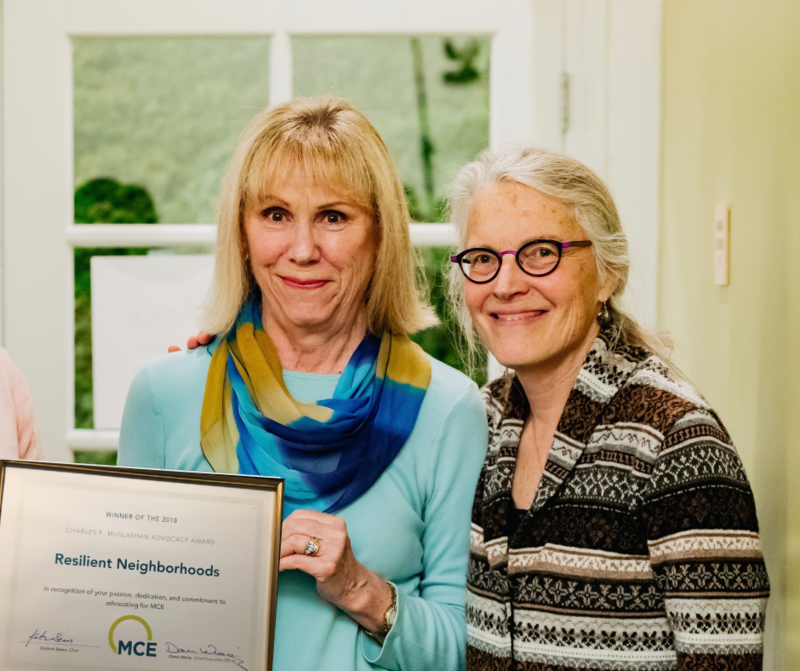 Resilient Neighborhoods received a generous grant from the Marin Climate and Energy Partnership (MCEP) to help us build Climate Action Teams in all of Marin’s cities and towns. MCEP is a countywide partnership working to reduce greenhouse gas emissions in government operations and our communities. Read more about MCEP here. Resilient Neighborhoods was featured in the City of San Rafael Volunteer newsletter for its contributions to the City. Read more here. Click on picture above to watch a 5 min. interview on Marin's TV's news program, "Seriously Now".